Quarter frame circle shaped heap of organic dried goji berries rotating on turn table. Isolated on white. Loopable. Close up macro. View from above/overhead. Panning shot across glass mason jar & ceramic bowl filled with dehydrated goji berries on striped wooden table with hessian cloth. 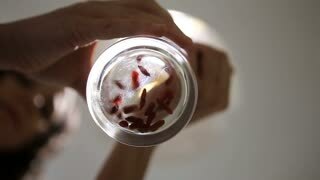 A jar of dried goji berries rotates slowly against a white background. Copy space to the right. Dried goji berries in a glass bowl rotating on a white background. Copy space on the right. Circle shaped heap of organic dried goji berries rotating. View from above/overhead. Isolated on white. Loopable. Close up macro. 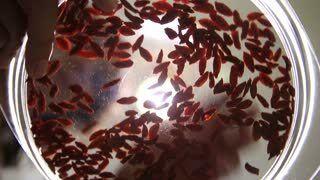 Full frame background of organic dried goji berries rotating on turn table. Loopable. Close up macro. Angled view. Healthy breakfast table, homemade pancakes with banana, goji and walnuts. Healthy breakfast table, homemade pancakes with kiwi, banana, goji and walnuts. 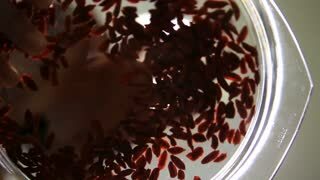 Pouring dry goji berries - Lycium barbarum - in bowl. White background. 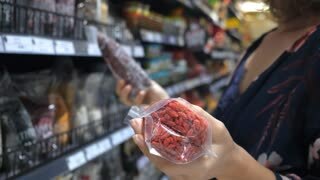 Goji berries from south China - whole fruit or its extracts are said to have numerous implied health effects. Selective focus.